Ankara’s tanks have been in the news a lot this year, whether prowling the streets of the Turkish capital in a failed coup attempt, or taking missile fire from rebel fighters on the Syrian border. Recently, Turkish armor crossed over into Syria and drove the Islamic State terrorist group from its last holdings along the Turkish border — and also fought with U.S.-backed Kurdish rebels, creating a frustrating diplomatic quandary for the White House. It’s easy to see why Turkey’s tanks are so active. The country is facing one of its worst geopolitical crises in decades, and it also maintains an enormous tank force — more than 2,400 all told, greater than the tank forces of France, Germany and the United Kingdom combined. But only Turkey’s 354 German-made Leopard 2A4 tanks are modern designs, and even those date back to 1985. The vast majority of Turkey’s tanks are American-made M-48 and M-60 Patton tanks. The latter type, which entered service the same year as the Cuban Missile Crisis, is rather long in the tooth. But curiously enough, the M-60 has seen the most combat. The M-60, informally called the Patton after the M-48 Patton and the famous American general, was a brawler of a machine designed to outmatch the ubiquitous Soviet T-54 by virtue of its heavier armor and long M68 105-millimeter gun. This latest “Patton” was the last in a family of tanks including the M-46, M-47 and M-48, all armed with 90-millimeter guns. The M-60 didn’t see action in the Vietnam War, except for bridge-laying and engineering variants. However, in the 1973 Yom Kippur War, Israeli M-60s rushed to relieve a force of 170 M-48 and Centurion tanks defending the Golan Heights from a Syrian invasion of 800 T-54s and T-62 tanks. During several days of perhaps the most intense armored warfare in history, Israeli tanks and artillery crushed the Syrian attackers, counter-attacked and drove within striking distance of Damascus. The Patton was so well-liked that Israel produced several generations of upgraded Mag’ach Patton tanks, the last of which remained in service until 2014. However, the war demonstrated that Patton tanks were vulnerable to anti-tank guided missiles just beginning to proliferate around the world. When M-60s counterattacked Egyptian troops crossing the Suez Canal, those troops blew away the Israeli tanks — their hydraulics prone to bursting into flames — with portable AT-3 Sagger missiles. To bolster its own tank fleet, the Soviet Union introduced the T-72 tank in the 1970s. This popular machine featured — at the time — superior armor and a more powerful gun. By the ’80s, the U.S. military began replacing the M-60 with the M-1 Abrams, a tank which possesses a far more decisive edge over its Soviet-era rivals than the Patton ever did. Not only is the Abrams a superior tank hunter, its composite armor is better protected — although not invulnerable — from the shaped-charge warheads of anti-tank missiles. M-60A1 and A3 Patton tanks still served with the U.S. Marines during the 1991 Persian Gulf War. These saw heavy combat against Iraqi tanks in Kuwait, knocking out around 100 tanks for the loss of just one Patton — largely testifying to the imbalance in training, tactics and supporting arms of the opposing forces. How vulnerable is the M-60? To begin with, its main gun ammunition is not separately stowed, as it is on the Abrams, making the shells more likely to detonate if the armor is penetrated. That would be less concerning with modern armor. Except the M-60 has old-fashioned conventional steel armor, with a maximum frontal armor rating equivalent to 253 millimeters of rolled hardened armor (RHA) — the standard measure of tank armor effectiveness. By contrast, ’90s-era 120- and 125-millimeter sabot shells can pierce the equivalent of around 800 RHA, and the AT-17 Kornet anti-tank missile can penetrate 1,300 millimeters. Today, Turkey fields three types of M-60s, including 658 M-60A3 TTS vehicles with improved thermal sights for night combat, and 170 Israeli-upgraded M-60A1 Sabra Mark II tanks, designated the M-60T in Turkish service. Ankara fields 104 more M-60A1 tanks that it has yet to upgrade to M-60Ts. Additionally, the Turkish army retains 758 older M-48A5 Pattons. Turkey once operated as many as 3,000 M-48s, which saw extensive action in Cyprus in 1972. The aging vehicles have received upgraded 105-millimeter guns and targeting systems also used on the M-60A1s and A3s. The upgraded M-60Ts wield a new Israeli MG253 120-millimeter cannon, which offers comparable performance to the Abrams’ main gun. A more powerful engine boosts speed to 34 miles per hour, which is still slower than most modern tanks. The turret has reinforced appliqué armor — basically, bolt-on armor plates. An Israeli Magach 7C fitted with the same applique armor once reportedly survived 18 hits from AT-3 Sagger missiles fired by Hezbollah without being penetrated. However, bear in mind that the Sagger dates back to the 1960s, and current missiles have far greater penetrating power. The M-60T reportedly includes explosive reactive armor — bricks of explosives that prematurely detonate incoming missiles and shells. ERA is most effective protecting the tank from shaped-charge warheads fired from portable anti-tank missile launchers. However, it appears that some, if not all, of Turkey’s M-60Ts do not come with reactive armor, but sport additional appliqué armor instead. Turkish tanks do not lack experience. Since 1978, the Turkish military has battled Kurdish separatists seeking to form an independent state. The most prominent Kurdish separatist group in Turkey is the Kurdistan’s Worker’s Party, or PKK. Ankara has also opposed the advances of Kurdish separatists in neighboring Iraq and Syria. In 2008, 60 Turkish M-60 tanks crossed over Iraq’s border in the Operation Sun offensive targeting PKK bases. When the Syrian civil war erupted, Ankara deployed M-60 tanks along the border and provided support to rebels opposed to Syrian Pres. Bashar Al Assad. These tanks fired into Syria on occasion in retaliation for loyalist fire landing on the Turkish side of the border. However, the Turkish government also became concerned with Kurdish fighters holding territory in northeastern Syria. They mostly fought under the banner of the People’s Protection Units, or YPG, a group which Ankara insists is largely composed of PKK members. Infamously, when the Islamic State assaulted the Kurdish-held border city of Kobane, Turkish M-60 tanks overlooking the battle did not fire a shot at the Islamic State troops, though the Turkish government, under international pressure, allowed Kurdish reinforcements to cross the border in support of the beleaguered YPG defenders. Because the Kurds were one of the most reliable forces opposing the Islamic State, Washington began to provide them with extensive aid, first through air strikes and supply drops, and later with teams of Special Forces operatives. Ankara, for its part, arrived at a truce with the PKK and together pursued a peace process in 2013. However, a month after the Kurdish-affiliated Peoples’ Democratic Party made significant gains in the June 2015 elections, Turkish Pres. Recep Tayyip Erdogan called off the ceasefire, citing a recent spate of attacks. By that time, Turkey’s more permissive relationship with Islamic State militants crossing the Syrian border had ended. The terror group launched a wave of attacks and raids on Turkish targets, killing hundreds of civilians. Ankara’s steel beasts were soon fighting both groups. On April 21, video evidence appeared of Islamic State fighters firing a Kornet anti-tank missile at a Turkish M-60T tank, which was training Iraqi forces in Bashiqah, a town north of Mosul. Turkish troops returned fire and killed 32 Islamic State fighters, according to the Turkish army. The Kornet is one of the most effective Russian-made missiles, and its tandem-charge warhead has successfully pierced the armor of both the M-1 Abrams and Israeli Merkava tank. A picture of the vehicle released after the incident revealed that the missile damaged the vehicle — but it didn’t appear to fully penetrate. Fortunately, the crew survived — so the armor did its job. However, the missile apparently knocked the tank out of action. It’s possible the missile didn’t cause a full kill because it struck the side of the Patton’s turret rather than the center of mass. Subsequent clashes have been less kind to the Patton. In May 2016, Kurdish fighters claimed the destruction of two Turkish M-60s. In video footage of one incident, an anti-tank team cheered as their missile struck a tank deployed behind sandbagged defensive positions on the top of a hill. On July 15, Patton and Leopard tanks streamed into the streets of Ankara and Istanbul, blocking off the entrances to bridges and other strategic locations as part of an attempted coup d’etat. The forces supporting the coup fielded 246 armored vehicles, including 74 tanks, according to the Turkish general staff. Some opened fire on pro-government civilian crowds with machine guns, and others attacked the Turkish parliament. One M-60 even rolled over cars blocking its path. However, many tank crews were unwilling to fire on the dense crowds which surged around their vehicles. As the coup unraveled on the morning of July 16, many of the bewildered tankers surrendered to civilians — though an enraged mob lynched at least one surrendering crew member. The loss of Turkish tanks and their crews have escalated in the months since. On Aug. 24, Turkey launched an incursion into Syria codenamed Operation Euphrates Shield. A force including dozens of Pattons, mostly M-60A3s, supported Turkish-allied militias in an offensive on the Islamic State-held town of Jarablus. The jihadist fighters withdrew without exchanging fire, but the Turkish force continued its advance into villages held by Kurdish fighters. On Aug. 27 a Kurdish anti-tank team knocked out a Patton with a U.S.-made TOW missile, leading to the first Turkish death in the intervention. The destruction of a second Patton appeared on video shortly afterward. There are reports that Kurdish fighters knocked out or damaged four more tanks during the clashes. Nonetheless, the Turkish offensive successfully drove the Kurds from several villages, and Kurdish forces have mostly withdrawn to the east side of the Euphrates River. Fighting between the two parties has died down since, perhaps a result of pressure from Washington, which is greatly troubled by the fighting between two critical regional allies. On Sept. 3, a battalion of Turkish armor joined allied militias in opening a new front around the Syrian village of Al Rai, with artillery support from U.S. HIMARS rocket batteries. This time, the Turkish force did engage Islamic State fighters, and successfully eradicated the last of the terror group’s positions on the Turkish-Syrian border. However, on Sept. 7, the Islamic State released video footage of two Turkish Pattons near Al Rai taking hits from missiles — again likely to be Kornets. Testifying to the power of the Russian-designed missiles, the first tank violently burst into the flames, while the second erupted in a cloud of smoke and debris. The next day, Islamic State fighters filmed the destruction of yet another Patton near the village of Tal Hawa. This tank also erupted in flames, and only one of the crew of four is reported to have survived. It’s worth noting the M-60s in these cases were not deployed in hull-down position — that is, positioned behind the crest of the hill, leaving only their turrets exposed. Had they, the damage may have been less, and the missilers would have had a more difficult shot. But Euphrates Shield is not the first time Turkish tanks have crossed the Syrian border. In February 2015, a battalion of 39 Pattons crossed the border as part of a task force to retrieve the remains of Suleyman Shah, the grandfather of the first Ottoman emperor. The Turkish government was concerned that the Islamic State might overrun and desecrate the tomb. The losses suffered by the Patton prompted Offiziere to ask — where are Turkey’s superior Leopard 2 tanks? The Leopard 2 is the German counterpart to the U.S.-made Abrams, a next generation main battle tank that decisively outmatched its Soviet contemporaries in both firepower and protection. Turkey’s 2A4 variant was the first major upgrade of the design, adding improved titanium-tungsten armor and an automatic fire-suppression system. The 2A4 entered service during the final years of the Cold War. After the fall of the Soviet Union, Germany sold of hundreds of the beasts as it downsized its military. It wasn’t until the early 2000s, however, that Berlin approved the sale of 354 Leopard 2s to Turkey. Now 30 years old, the 2A4 is no longer quite in its prime, though it remains much tougher than the Patton. The 2A4’s frontal armor is rated around 700 millimeter RHA — and 1,000 millimeters RHA verses the shaped-charge warheads in anti-tank missiles, theoretically adequate to withstand most older anti-tank weapons. The German army currently operates the much improved 2A5 and 2A6 variants, which have a longer-barreled main gun and upgraded wedge-shaped spaced armor that gives them a space-age look compared to the boxy turret of the 2A4. Turkey has developed its own upgraded version of the 2A4, but has not put the upgrade into production. ☡: #Turkey continues to send a lot of Leopard 2A4 tanks towards Islahiye, near the border with #Syria. 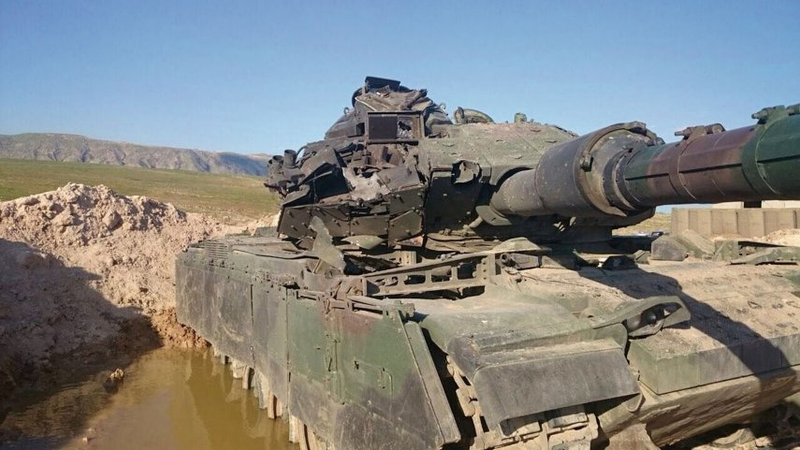 Turkish Leopard 2s have deployed close to Greece and Turkey, well away from the Syrian border. However, early in September, Leopard 2s reportedly embarked on trains destined for the Syrian border. Evidence of them in combat has yet to surface. Ankara still has nearly 400 German Leopard 1 tanks, which entered service four years after the M-60 Patton. The Leopard 1 is very fast and mounts a decent gun, but is not heavily armored. Turkey has 170 Leopard 1A1s upgraded with locally-produced Volkan targeting systems that enhance their accuracy and night-fighting capabilities. Ankara maintains a further 227 Leopard 1A3s, a variant with improved spaced armor and a wedge-shaped gun mantle. Nonetheless, like the M-60, the Leopard 1’s armor is vulnerable to modern anti-tank weapons. The Turkish military is awaiting its own domestically-produced main battle tank, the Altay, which incorporates technology from the South Korean K-2 Black Panther tank. The Altay could probably stand on equal footing to the Abrams and modernized Leopard 2 tanks — but only four have been made so far, and it isn’t set to begin full production until 2017. Besides tanks, Turkey has fielded numerous armored vehicles in the recent fighting, some of them unique domestic designs. ACV-15 infantry fighting vehicles have been prominent in Turkey’s incursion into Syria. The ACV-15, sometimes designated the ACV-300, is actually evolved from the boxy old M-113, the iconic rhombus-shaped armored personnel carrier of the Vietnam War. The U.S. Army has since mostly moved on to the more heavily armed and armored M-2 Bradley infantry fighting vehicle. The ACV-15-AIFV, on the other hand, converts the M-113 into a cut-price Bradley surrogate, with its own 25-millimeter cannon turret. The more numerous ACV-15-AAPC mounts a .50-caliber machine gun in a tiny open-topped turret. Both vehicles feature spaced ceramic armor panels. The Turkish army operates more than 2,000 ACV-15s, including anti-tank and mortar carrier variants. Another armored vehicle operating on the Turkish-Syrian border is the T-155 Firtina — a locally-produced knock-off of the South Korean K-9 Thunder self-propelled howitzer. The Firtinas have long-barreled 155 millimeter howitzers with a range of 30 to 40 kilometers depending on the ammunition. They can sustain a firing rate of two to three rounds per minute, or surge three rounds in 15 seconds, all timed to land at the same time. The Turkish army fields well over a hundred of the vehicles out of a final intended total of 350. The Firtinas first saw action against PKK forces in Iraq in 2008. They have since hit targets across the Syrian border — some of them , apparently, very close to the border. On April 30, the Islamic State released a video depicting AT-13 Metis-M missiles taking out a platoon of three Firtinas in sandbagged positions. Like most self-propelled artillery, the Firtina’s armor is for stopping shrapnel and small arms, not guided missiles — leaving one to wonder why the vehicles were in such an exposed position in the first place. Firtinas have been providing fire support for Euphrates Shield. Finally, the Otokar Kobra is a unique armored vehicle incorporating Humvee DNA. For one, it has the same suspension and wheel base. However, unlike the Humvee, it’s designed from the get-go with a mine-resistant v-shaped hull and better protection from small arms and shrapnel. There are a lot of different variants, including recon, anti-tank, and mortar-carrying vehicles. The basic version can carry eight passengers, and typically mounts a turret with a 12.7-millimeter machine gun or an automatic grenade launcher. Turkish Kobras have been heavily involved in the conflict with the PKK, and there are several videos of them ambushing unsuspecting PKK fighters. In return, the vehicles have suffered more than their share of ambushes, many documented on video. Despite reportedly having a good record surviving blasts from improvised explosive devices and mines, this has simply led to Kurdish fighters making bigger bombs. In August 2015, a 2,000 pound IED destroyed a Turkish army Kobra in Siirte province, killing its eight passengers. Kobras have also seen action in service with the Nigerian army in its war with Boko Haram, in Georgian service during the 2008 war with Russia, and with Turkish troops in Afghanistan. A new Kobra II vehicle weighing twice as much is entering service, and should have even greater protection from IEDs. Turkey possesses hundreds of other locally-produced armored personnel carriers, including the Ejder and Kirpi mine-resistant vehicles and the Akrep and ZPT armored cars. On Sept. 16, Turkish tanks embarked on a third offensive into Syria, this time supporting allied rebels in a push on the Islamic State-held city of Al Bab. The offensive has reportedly captured more than a dozen villages, though the Islamic State claims to have knocked out a Turkish tank on Sept. 18. Turkey’s armored vehicles will likely face further combat with determined and well-armed fighters from both the Islamic State and Kurdish militants — let alone the possibility of unintended clashes with the Syrian army. Washington would prefer Turkish guns to remain pointed toward the Islamic State, but unfortunately the enmity between the Ankara and Kurdish separatist groups runs long and deep — and may prove to difficult to patch over as retreating jihadists leave behind a territorial vacuum that both parties will likely seek to fill. There are also tactical lessons for the Turkish army. The M-60 tanks at the spearhead of Ankara’s war effort pack intimidating firepower and have generally succeeded in securing their objectives. However, these tanks remain a product of another era, and remain vulnerable to deadly anti-tank missiles widely employed in Syria. Whether the Turkish military will risk its Leopard 2s in an effort to mitigate losses — and whether those tanks would fare better against experienced missile teams armed with powerful missiles such as the Kornet — is far from clear. The same could be said regarding the end game of the Turkish intervention in Syria.